President Obama last week sent Congress a budget request for fiscal 2012 and beyond that would extend through fiscal 2015 the freeze in non-security discretionary spending that he requested last year. It would curtail some programs while expanding others, make a few changes to entitlements, preserve tax cuts for the middle class after 2012 while allowing taxes on upper-income taxpayers to rise, and increase taxes on multinational corporations. 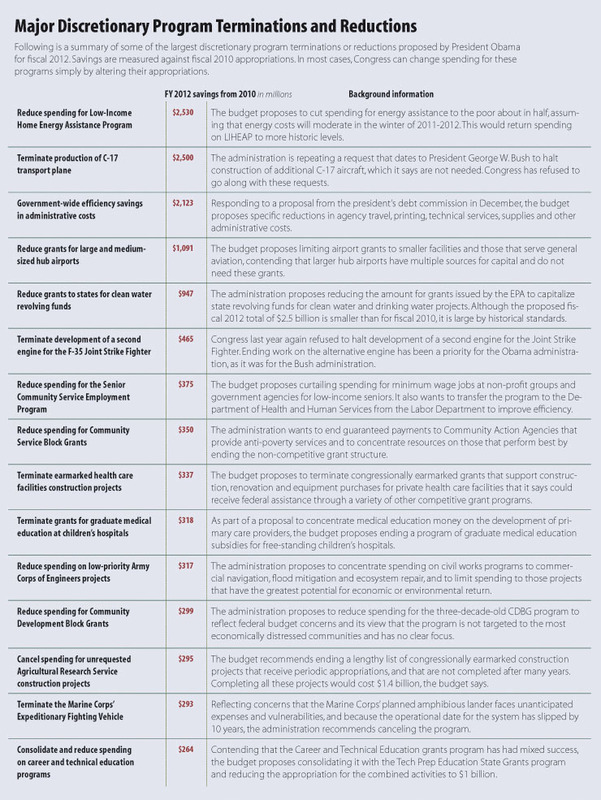 If all these recommendations were adopted, over the next decade federal outlays would increase to $5.7 trillion from $3.8 trillion in the current fiscal year, and the deficit would be reduced by more than half. The amount the government has borrowed from the public would roughly stabilize over that time at about 77 percent of gross domestic product. The fiscal 2012 budget forecasts that borrowing from the public would stabilize at roughly 77 percent of gross domestic product in this decade but would rise rapidly in future years without additional budgetary changes. Appropriations: The process by which Congress provides new budget authority for discretionary federal programs, in theory though often not in practice through enactment of 12 separate appropriations bills. Budget authority: Permission, provided by law, for federal agencies to spend or otherwise obligate money. Budget outlays: Money that is actually spent in a given fiscal year, as opposed to money that is appropriated for that year. One year’s budget authority can result in outlays over several years, and the outlays in any given year result from a mix of budget authority from that year and prior years. Budget authority is similar to putting money into a checking account; outlays occur when checks are written and cashed. Budget resolution: A concurrent resolution that is adopted by both chambers, but is not signed into law, and is used to guide appropriations actions and other budget changes for the coming fiscal year. Established by the 1974 Congressional Budget and Impoundment Control Act (PL 93-344), the budget resolution is supposed to be adopted by mid-April, but the deadline has frequently been missed in recent years. Congress did not adopt a budget resolution at all for five of the past 12 years, including fiscal 2011, the current year. Budget resolutions can also direct committees to take actions to change spending and revenue through the reconciliation process. 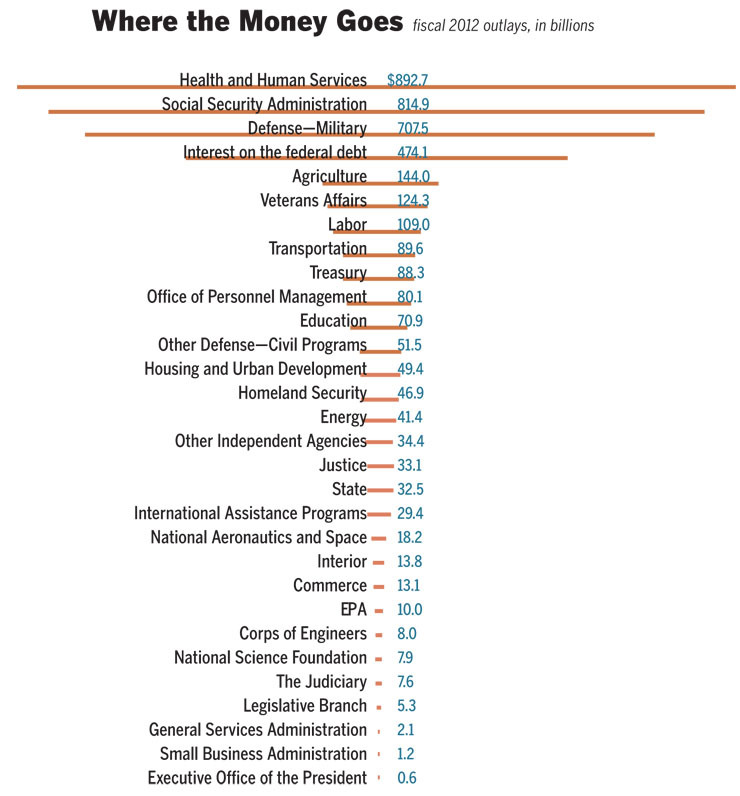 Discretionary spending: Spending for programs that Congress finances as it chooses through annual appropriations. Roughly a third of all federal spending falls into this category. Examples include the military; the basic operations of all federal agencies, Congress, the White House and the federal court system; and programs that support education, space exploration, scientific research, child nutrition, housing, transportation and foreign aid. Fiscal 2012: The budget year that runs from Saturday, Oct. 1, 2011, through Sunday, Sept. 30, 2012. Mandatory spending: Mostly this includes spending for entitlement programs, whose eligibility requirements are written into law. Any person who meets those requirements is entitled to the money until Congress changes the law. Examples include Social Security, Medicare, Medicaid, unemployment benefits, food stamps and federal pensions. Another major category of mandatory spending is interest paid to holders of federal government bills, notes and bonds. Both Social Security and interest payments on the debt are permanently appropriated. Although budget authority for some other mandatory programs is provided through the appropriations process, appropriators have little or no control over the money. Mandatory spending accounts for about two-thirds of all federal spending. Off-budget: An accounting convention that relates to spending and receipts for a few programs — in particular, the Social Security trust funds and the Postal Service — that are not counted for some specific budget calculations. Generally, however, off-budget is a distinction with little practical effect and most references are to the so-called unified budget, which includes all federal activities. Reconciliation: The process by which tax laws and spending programs are changed, or reconciled, to reach outlay and revenue targets set in the annual budget resolution. Established by the 1974 Budget Act, reconciliation was first used in 1980. The most recent reconciliation bill completed by Congress was a 2010 measure (PL 111-152) that modified the landmark health care law and overhauled student loan programs. Rescission: The cancellation of previously appropriated budget authority — a common way to save money that already has been appropriated. To take effect, a rescission bill must be passed by Congress and signed by the president (or enacted over his veto), just as an appropriations bill is. Revenue: Income taxes paid by individuals and corporations, taxes on estates, excise taxes on tires and fuels, customs duties and some user fees account for most receipts collected by the federal government. Some receipts and user fees show up as offsets against program outlays, however, and do not count as revenue. Feb. 14: President Obama submits his fiscal 2012 budget request to Congress. Feb. 15: Congressional committees begin hearings on president’s budget request. April 15: Statutory deadline (though frequently missed) for Congress to complete its annual budget resolution. The resolution sets a limit on discretionary spending and may include instructions for a reconciliation bill. May 15: The date after which the House may consider fiscal 2012 appropriations bills even if a final budget resolution has not been adopted. June 24: Last day before the House begins its Independence Day recess, the informal deadline that House leaders traditionally have set for passing all 12 regular appropriations bills. Mid-July — President submits his mid-session review of the budget to Congress, which includes revised deficit estimates. Aug. 8: Beginning of the Senate’s summer recess. This is the Senate’s informal deadline for passing all 12 spending bills. 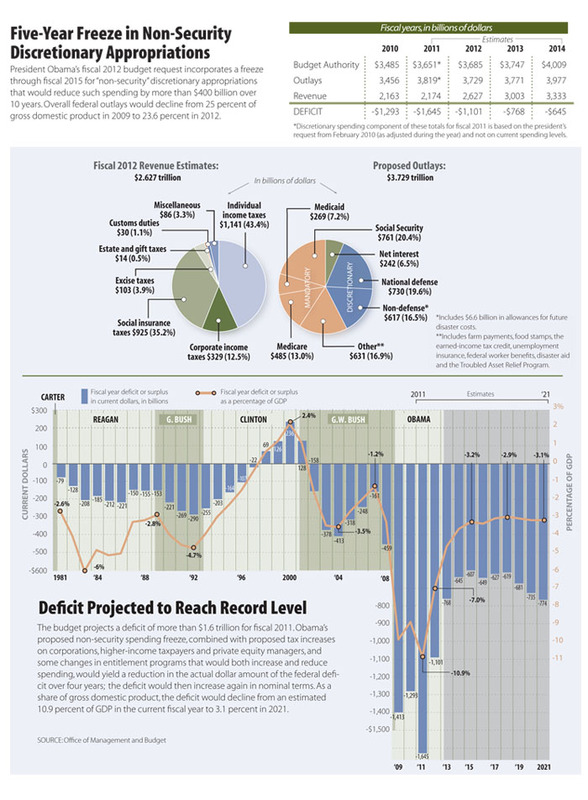 Mid-August: Congressional Budget Office issues updated budget and deficit projections. Sept. 6: House and Senate return from their summer recess with 25 days to negotiate their differences and clear all appropriations bills before the new fiscal year. Oct. 1: Fiscal 2012 begins. A continuing resolution would now be required to finance any agency whose appropriations bill has not been enacted. 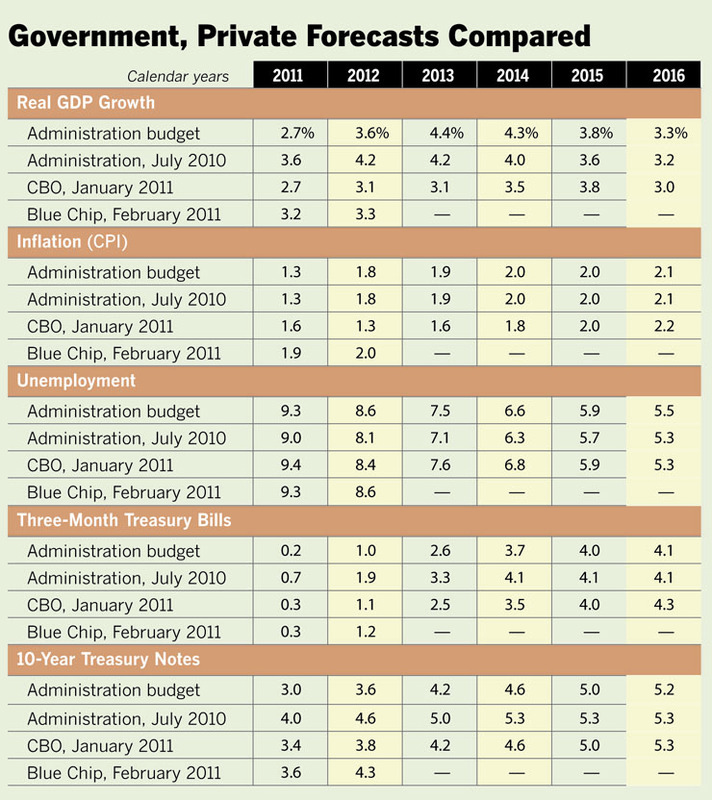 This comparison of the forecasts of the administration, the Congressional Budget Office (CBO) and the most recent Blue Chip consensus of private economists uses annual percentage changes in inflation-adjusted gross domestic product (GDP) and the consumer price index (CPI). The unemployment rate and the interest rates for Treasury bills and notes are annual averages. The administration’s forecast assumes enactment of the president’s budget and therefore is not strictly comparable with those of the CBO and the Blue Chip consensus. 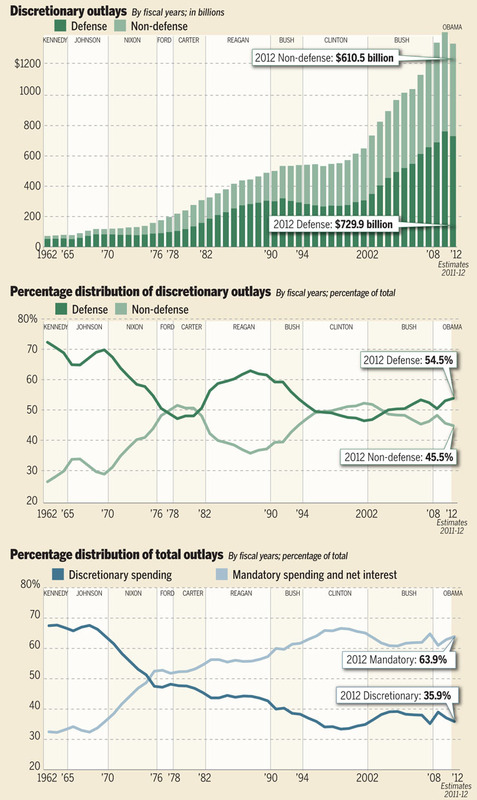 The share of federal outlays that is discretionary, and thus controlled by the annual appropriations process, has shrunk from more than two-thirds in the early 1960s to about one-third today. Except for a few brief periods in the past half-century, defense has accounted for a majority of discretionary spending, and the share that is allotted to non-defense programs continues to shrink. 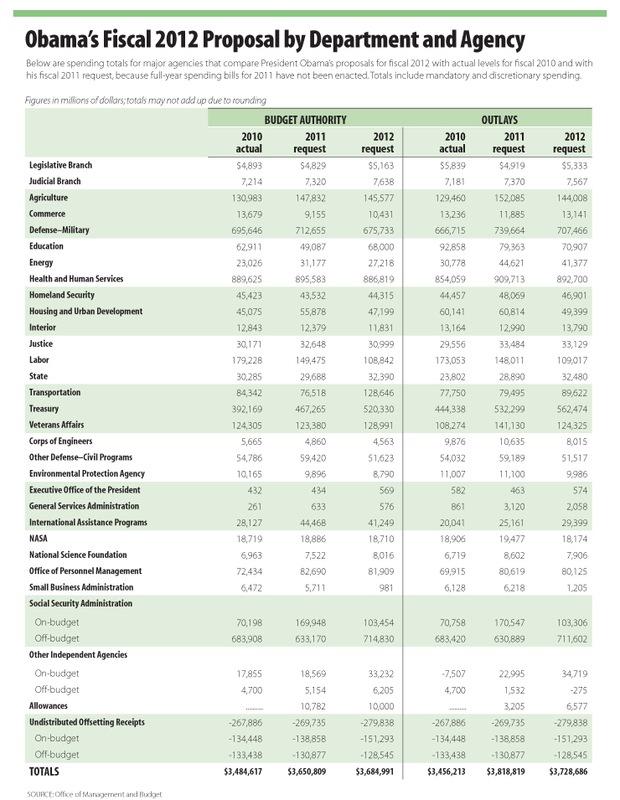 Moreover, President Obama proposes outright reductions in both defense and non-defense outlays in fiscal 2012.